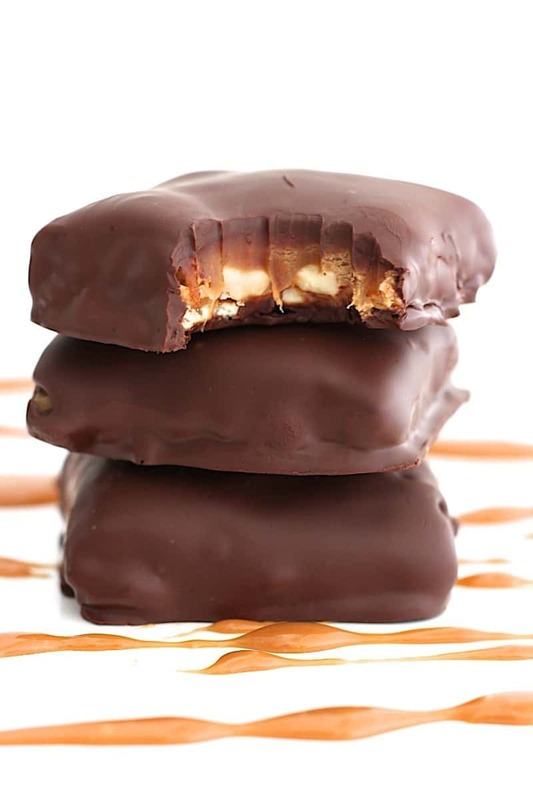 Make one of your favorite candy bars at home with just 5 of the most amazing ingredients on Earth: dark chocolate, peanut butter, pretzels, caramel and peanuts! 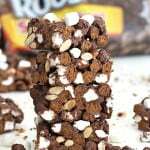 Okay, I need to make this post short and sweet so you can make these candy bars ASAP! They’re one of the best things ever created in my kitchen and I want your kitchen to have the same bragging rights! They’re so easy, but it was a labor of love getting the recipe just right. I was on a mission to make a homemade candy bar similar to Take 5 candy bars, but even better, of course! More pretzel crunch, a thicker layer of peanut butter, extra peanuts, gooier caramel and a richer chocolate. I tried them every which way I could until I got them just right. I tried layering the chocolate with the other ingredients in the pan, but definitely felt coating the bars in the chocolate is much better. I tried using caramel sauce, but melted caramel squares gives the bars that perfect gooey caramel layer. I tried crushing the pretzels, but the whole pretzels gives a perfect pretzel crunch in every bite. The sweet and salty combo of these 5 ingredients along with the different textures each one contributes to the layers makes these homemade candy bars one of the greatest things I ever ate! They’re off the charts when it comes to how delicious they are! did you really make these?! I can’t wait for you to make and experience them too! Enjoy! 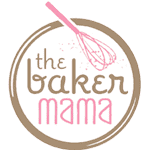 Line a 9x13-inch rimmed baking pan with parchment paper and spray with non-stick cooking spray. Layer the pretzels snuggly in the bottom of the pan. Melt the peanut butter in the microwave for 30 seconds until of drizzling consistency. 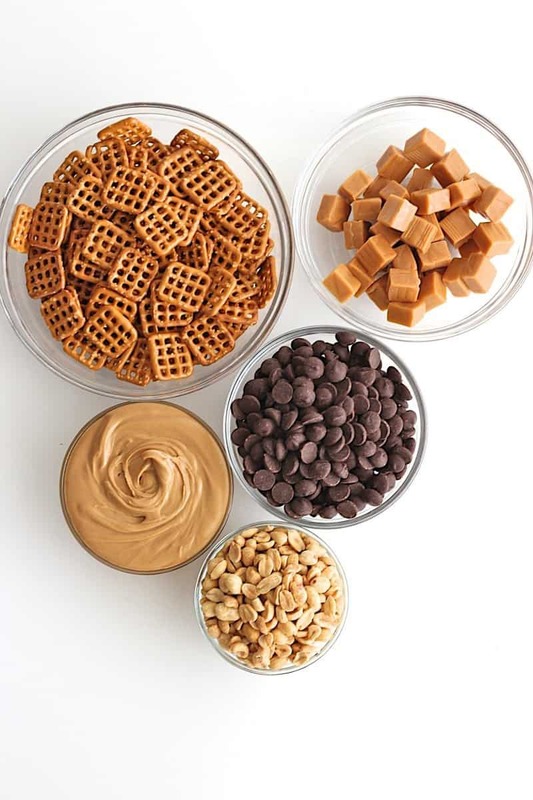 Drizzle peanut butter over pretzels. With a spatula, spread the peanut butter evenly to cover all of the pretzels. 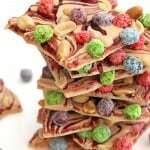 Sprinkle the peanuts evenly over the peanut butter layer and place the pan in the refrigerator for 30 minutes to set. While the peanut butter layer is setting, unwrap the caramels. Place them in a microwave-safe bowl with ¼ cup water and melt in the microwave for 1 minute. Remove and stir. Place back in the microwave for 30 seconds. Remove and continue to stir until caramel is smooth and of drizzling consistency. 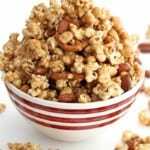 Drizzle caramel evenly over all of the peanuts. Place pan back in the refrigerator for 1 hour. Remove from the refrigerator and immediately cut into 2x2-inch squares with a sharp knife. Spread squares out on a parchment-lined baking sheet and freeze for 15 minutes. 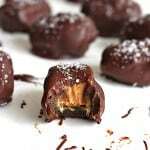 Melt the chocolate (1 bag at a time) in a shallow microwave-safe bowl for 1 minute. Remove and stir. Return to microwave for 30 seconds. Remove and continue to stir until all of the chocolate chips are melted. Line another baking sheet with parchment paper. Remove the candy bars from the freezer. 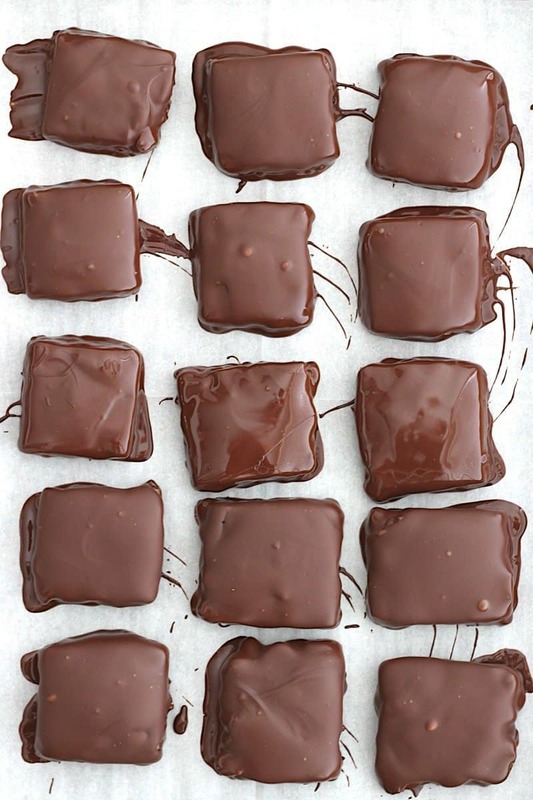 Using a fork, dip the candy bars one at a time into the melted chocolate until each one is completely coated in chocolate. Make sure the pretzel layer remains on bottom. Remove and let excess chocolate drip off of the candy bar and the fork before placing on the parchment-lined baking sheet. Repeat with remaining candy bars and remaining chocolate chips until all candy bars are coated. Place candy bars back in the refrigerator to set for at least 15 minutes before enjoying. If you live in warm temperatures, store candy bars in an airtight container in the refrigerator. 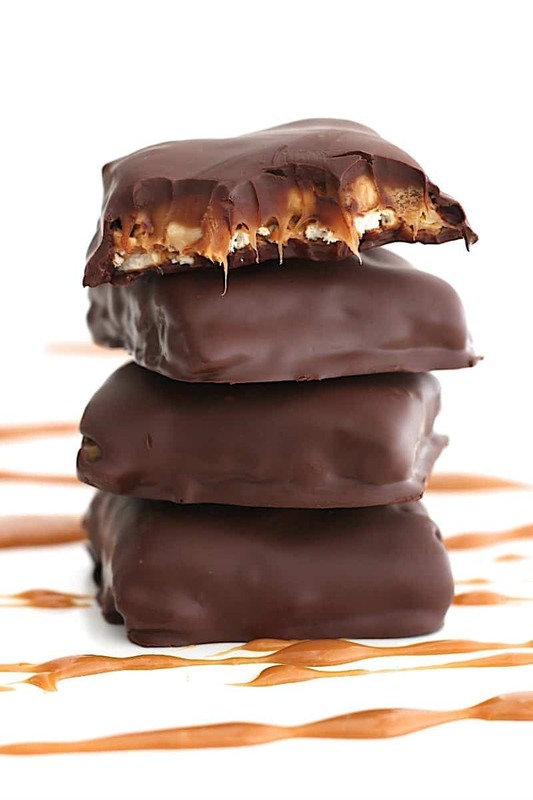 Let candy bars set out for about 5 minutes before eating to let the caramel soften a bit. Otherwise, store candy bars in a cool, dry place. 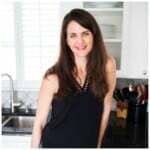 I love, love your pictures…The recipe is simple and easy. I think I’ve died and gone to heaven. I LOVE Take 5 bars, and this homemade version has my heart. I cannot WAIT to try these out!! would I be able to use semi sweet chocolate chips? Hi Christine! Yes, of course, as long as they’re good melting chocolate chips. Enjoy! Did you use salted peanuts when you made these or unsalted? 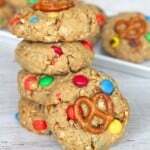 These look so good, can’t wait to make them! Hi Helen! Great question! I used roasted lightly salted peanuts. Enjoy! Can these be frozen a week ahead? Hi Kasey! Yes, they freeze great. Just be sure to store them in a freezer safe container or baggie. Enjoy! I’m not a fan of dark chocolate, would they taste as good with milk chocolate? Hi Deanna! Yes, of course, milk chocolate would taste great too. Enjoy! Hi! I was wondering why these need to be stored in the fridge. Thx so much! Yessss! 24 bars would cost $4.80 ( pack of 5 for $1) at the store. Take 5s are my new favorite so, after while it would be considered a *luxury* item. This recipe will be saving so much money, mostly because I won’t be sharing. Thank you!! I honestly was going to find the ingredients and throw it in a bag and call it trail mix. How many pretzels go into each bar? I’m guessing 3? But 2 would only have 2 because of starting with 70 pretzels, right? And should I just spread the peanut butter over the top pretzel in the stack? Will it ooze down into the others? Hi Katie! It depends on how you cut the bars as to how many pretzels end up in each one. If scroll through the post, you can see step-by-step pictures on how to make them. I hope this helps. Enjoy! These look seriously incredible! Take 5 bars are one of my favorites and yours look even better than the store bought ones! Thanks Aimee! I wish we lived closer and I’d bring you a whole batch to enjoy as you snuggle that new baby boy. Congrats, friend! These are AMAZING!! I have made them several times and I can’t get enough. All of my family and friends love them too and they can’t believe I made them. Hands down a favorite recipe. These are awesome!! My mother’s favorite candy bar that I can now make for her whenever she’s visiting! Awwww it looks delicious! I have to do it! I wouldn’t recommend using natural peanut butter – I think it made the bars too sticky and hard to handle. I had trouble with the chocolate. The chocolate doesn’t seem to drip off at all and each bar ended up having 1/2 cup of chocolate on them. I ended up “frosting them” on 2 sides. but these are a sticky delicious mess. Hi Nancy! I agree not to use natural peanut butter. The thicker the peanut butter, the better. What brand of dark chocolate chips did you use? Sounds like you might need to use a better melting dark chocolate chip or that the chocolate chips were over melted causing the chocolate to be too thick. Happy you still enjoyed them though! can I make it with out having the paper? i just have the pans? Hi Kaylee! You’ll need to use something to be able to lift the bars from the pan and cut them into squares. Do you have foil or plastic wrap you could use? If not, you could try spraying the pan with non-stick cooking spray and hope that when you cut the bars in the pan, they cut and lift out of the pan easily. Hope this helps. Enjoy! Can these be made with a layer of chocolate on the bottom? I’m thinking that would be easier than dipping. Hi Mar! Absolutely. I’ve seen a few people make them with a layer of chocolate on bottom and then a layer on top instead of dipping them. The bars just won’t be completely coated in the chocolate. Or you could layer chocolate on bottom and then cut them as instructed and lay them on a rack with a pan underneath before pouring the chocolate over each one so that the chocolate flows down and around each bar and coats it. Hope this helps. Enjoy!